Dollar spot is most common during warm, wet weather with heavy dews and in those lawns with low levels of nitrogen. 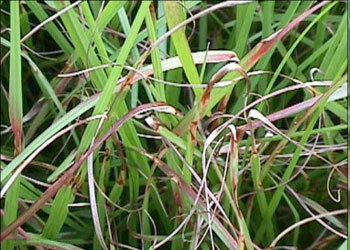 Dollar spots are most common to Kentucky Bluegrass, Bent Grass, and Bermuda in humid climates. They get their name from their small silver dollar-like shape, but can begin as the size of a small grapefruit. Usually looks brown or straw-colored in appearance. The spots may merge to form large patches several feet wide.